I was curios to find how Google plans to restart the Google TV project, so I checked the developer sites for Google TV and Android TV to find some differences. Android TV seems to be a simplified Google TV built along the lines of Apple TV. "Google TV devices always include a keyboard and a pointing device that controls the cursor. Many users will have these next to them as they view TV. The two may be combined into a single physical device, and this device may also include a mouse controller." Android TV has a more limited scope: "On a TV device, users navigate with controls on a remote control device, using either a directional pad (D-pad) or arrow keys." While keyboards are still supported, they're no longer that useful. While Google TV devices included keyboards, Android TV recommends developers to avoid text input. "Avoid making users enter text whenever possible, and use voice interfaces when you require text input." Google TV's dev pages suggested to "limit each paragraph to no more than 90 words and break text into small chunks that users can quickly scan". Android TV's guidelines tell developers to "avoid using on-screen text to convey information and purpose. Tell your story with pictures and sound." 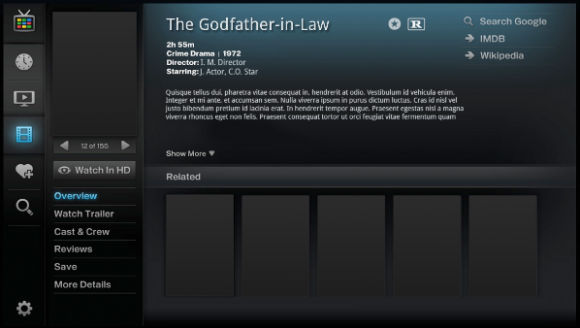 Google TV included a browser with Flash support and encouraged developers to optimize their sites for the platform. Android TV tells a different story: "The TV is an entertainment interface, not a computer or mobile device. Optimize for activities that put content at the center: from the casual posture of movie-watching, to immersive gameplay, to hanging out with friends in a living room." And another thing: "We discourage including web browsing in games for Android TV. The television set is not well-suited for browsing, either in terms of display or control scheme." One of the main issues with Google TV was that it was complicated to use. "Android TV is simple and magical. It's all about finding and enjoying content and apps with the least amount of friction." Google TV's goal was to bring the Web to the TV. That didn't work well: content providers blocked Google TV, input devices were clunky and people didn't like browsing the Web on their TVs. 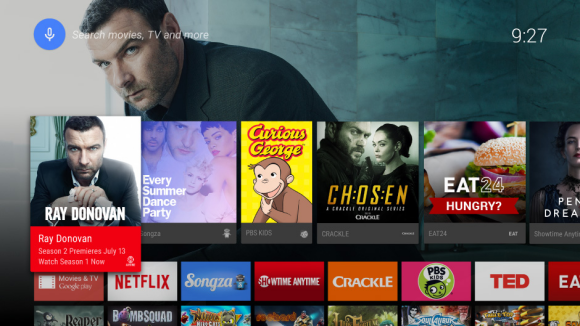 So now Android TV tries to bring the Android ecosystem to the TV: the focus is on content, immersive interfaces and simple navigation.